Established in 2016 by Elizabeth L. Thomson (LLB '74, BCL '75) for undergraduate students in the Faculty of Law to take the initiative to gain practical experience during their studies and to provide opportunities for students to broaden their horizons. Awarded by the Faculty of Law to a BCL/LLB student undertaking an international internship in Hong Kong. Preference will be given to Canadian citizens and who have not resided or travelled in Asia. The recipient of the award must agree to disclose his/her personal information to the donor, including name, educational history, and internship destination. This award is part of the McGill International Experience Awards. For more information, click here. Must hold an acceptance to undertake a summer internship in Hong Kong. Vanessa has recently completed her third year at McGill Law. She has decided to focus her law studies in the area of commercial negotiation and dispute resolution. She is also completing a minor in Hispanic studies. Vanessa has worked at a law firm in the litigation and corporate law departments, and also holds a certificate in International Legal Perspectives from Pantheon-Assas (Paris 2) University. Thanks to the Elizabeth L. Thomson International Experience Award, Vanessa has been able to pursue a prestigious internship at the ICC International Court of Arbitration this summer. She is working for the Court's Hong Kong case management team. At this world-renowned arbitral institution, Vanessa has had the opportunity to help prepare for Court sessions, review high-impact arbitral awards, conduct meaningful legal research and complete interesting legal assignments. This experience has been life-changing, and it would not have been possible without Elizabeth Thomson's generosity. This was an incredibly enriching opportunity that taught me not only about the law but also about the rich culture of Hong Kong. Without the funds that I received, I would not have been able to pursue this internship. When I applied for this international activity, as well as your award, last winter, it was my goal to work for an international legal organization. I was eager to learn more about international law, build my professional network around the world, and to immerse myself in a new culture. I had two overarching motivations at the time. First, I wanted to see the theory that I learned in my courses at school come to life in a global context. I am completing a major in Commercial Negotiation and Dispute Resolution at McGill Law, and I am taking courses such as Private International Law, Resolution of International Disputes, and International Business. Although I have learned an incredible amount through my studies, it was very important for me to gain hands-on experience. Second, I knew that the challenge of immersing myself in a new culture would be one of the most rewarding learning experiences of my life. This is exactly what I was able to do this summer in Hong Kong. I worked for the world’s top arbitral institution, the ICC International Court of Arbitration. In Hong Kong, I worked for their Dispute Resolution Services’ Case Management Team. As a legal intern, I conducted a significant amount of legal research, worked with brilliant lawyers every day on significant, multi-million dollar cases, and attended and assisted in weekly court sessions in Hong Kong. As a result, I gained theoretical and real-world insights into the realities of business law on an international scale. In addition, I met many professionals in the field of international arbitration and enjoyed attending network events for McGill Law alumni, women in entrepreneurship, and young professionals. Thank you again for inviting me to these events, and for introducing me to such inspiring people. This summer, I grew professionally and personally due to my experience in Hong Kong – you were a very important part of it, not only through your generosity but also through your kindness and warm welcome. I thoroughly enjoyed my time in Hong Kong, and was so surprised to see three months pass so quickly! I loved the city and its vibrant character, but more so, I loved my work as a legal intern at the ICC International Court of Arbitration. The highlight of my international activity was the bi-annual ICC Asia Conference, in which I was able to meet world-renowned arbitrators and ICC Court members and learn even more about the field of international arbitration. In fact, I was also the only intern selected to write a report on this major event, and it will be published in the upcoming ICC Bulletin, the institution’s quarterly journal. Although I enjoyed every moment of my work in Hong Kong, hindsight has only deepened my appreciation for this entire experience. This has had a significant impact on my life, and I know that it will shape my future career and education path. I now see very clearly that international arbitration is the branch of law that I want to practice, and I am even considering pursuing graduate law studies in order to specialize. My internship in Hong Kong truly opened my eyes to future possibilities, and I am so grateful for that. Overall, the generosity of Ms. Elizabeth L. Thomson has had a great impact in my career. Without the Elizabeth L. Thomson International Experience Award, I would have missed the experience of a lifetime. I thank you for giving me this incredible opportunity, but also for greeting me in Hong Kong with open arms. This is something that I will always remember very fondly and with sincere gratitude. 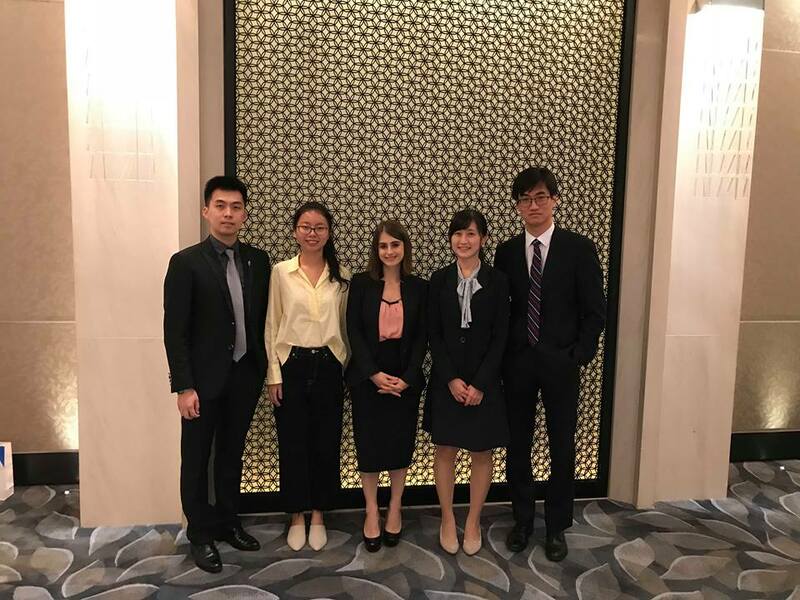 Vanessa Di Feo (centre) at the Bi-Annual ICC Asia Conference in Hong Kong, with other legal interns. Vanessa was the intern selected to write a report on the Conference, which will be published in the ICC Bulletin. Sydney just completed her first year at the Faculty of Law at McGill University, while her academic background lies in anthropology, equity studies, and women and gender studies. She has organized in both Toronto and Montreal around issues of environmental justice, sexual violence, Indigenous solidarity, and corporate accountability within the Canadian mining industry. She will be interning at the Mission for Migrant Workers in Hong Kong this summer, a legal clinic and NGO that provides guidance to migrant domestic workers on legal procedures resulting from precarious work, gendered violence, and immigration law. My name is Sydney Lang and I am a second year law student. Before coming to McGill, I spent four years at the University of Toronto studying anthropology, equity studies, and women and genders studies. There I developed an interest in social justice, specifically Indigenous solidarity, environmental justice, and community organizing. As I began my legal education, my interests shifted to issues of mining justice and migration. In my undergrad, I participated in an academic exchange and several international field courses and research projects. However, I had yet to participate in an internship. I thought that an international internship would be a good way to start my legal education as it would provide me with an opportunity to engage in hands-on legal work that I had yet to learn in the classroom, while also the ability to apply some of the legal skills and knowledge that I had learned at McGill, but had not yet put into practice. I wanted to learn more about the way that the law operates around the world, how it further oppresses and marginalizes some people, and its potential when used in a grassroots, community-based setting. The Mission’s work is divided into several “clusters”: the two main clusters are advocacy and service. The advocacy cluster works on issues of policy change, lobbying various governments, and campaigns that engage international, Hong Kong, and migrant worker communities. The service cluster does case work and works directly with clients seeking legal assistance and other types of support. I was a member of the service cluster throughout my time at the Mission. As an intern, and a junior case officer, my duties included the following: attend to clients coming from neighbouring Asian countries, a majority of whom are in Hong Kong as domestic workers; provide timely guidance to clients on legal procedures and migrant rights; assist clients in filing claims and notices with the Labour Department, Immigration Department, and District Court; accompany clients in conciliation meetings, tribunals, and court hearings; and assist with the walk-in centre, advocacy projects, and temporary shelter. As a law student, I have been grappling with the ways that the law can be a tool of cooptation, oppression, and justice, often at the same time. I wondered if every day legal work is actually able to change oppressive systems, or if it just makes us complicit in them. I wondered if human rights discourse is actually the most powerful in making changes in the lives of the most oppressed: those who are most targeted by the legal system. The Mission made me realize the crucial importance of legal clinics in assisting those who are in precarious situations and are unable to navigate the legal system on their own. It made me understand that this type of work, although often legitimizing an oppressive and unfair legal system, is essential in the survival of vulnerable populations: in this case, migrant women. This understanding of work, legal support, and law has and will continue to significantly shape the ways that I engage with my legal education and future career. While at the Mission, I began to understand the importance of labour law and worker organizing; it was reiterated to me that “work is work”. This is where my previous work in women and gender studies - studying emotional labour, domestic work, and gendered work - became useful. A highlight of the internship was working directly with clients. Although our clients did not always have a strong understanding of their rights or the law, they were creative and strong in ways that helped them throughout their hearings and legal proceedings. I saw women who were physically assaulted, framed, and emotionally harassed by their employers go to prison, get deported, and pay their employers money that their employers actually owed to them. But I also saw women win their claims in court, support one another, and learn about their rights and defend them to a judge or presiding officer. The funds that I received helped me live in Hong Kong for two months and volunteer with an organization that does not have the funds to pay for more than five staff members, but does important life-saving work that requires the support and time of dozens of volunteers. I would like to thank Ms. Elizabeth L. Thomson for this incredible opportunity. 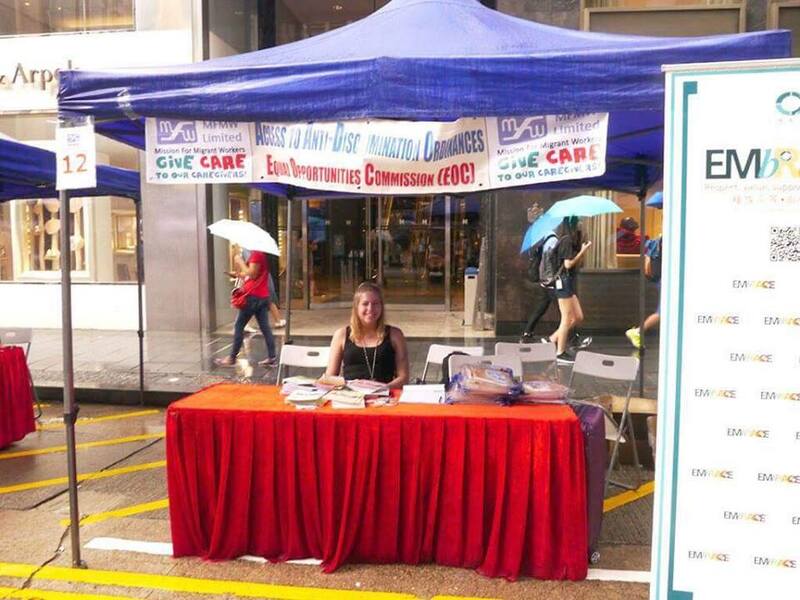 Sydney Lang at the Giving Care to Our Caregivers (GCC) street fair. The Mission for Migrant Workers hosts this event every year on Chater Road, where many Filipina domestic workers spend their rest days on Sunday.